Dr. Ali Parsa, CEO and founder of Babylon, made the announcement at an event organized this week at Babylon's headquarters in London. Babylon has announced that it is investing $100 million (75 million pounds) to double its London team of scientists and engineers, expand its capabilities, and apply artificial intelligence to assist with management of chronic diseases. Babylon CEO and founder Dr. Ali Parsa said the investment was a "strategic catalyst in helping to support and foster the necessary R&D ecosystem for Britain to remain at the forefront of global AI innovation" as the company was developing technology to allow users to monitor and manage chronic conditions — with its AI set to do a health assessment and then create a personalised treatment plan. “Global healthcare providers are experiencing an acute shortage of physicians and nursing staff. The result is that sometimes those who are most in need — such as people with chronic conditions like mental health or diabetes — do not receive the consistent care they deserve. “[AI] has the potential to improve the capacity of our healthcare professionals to safely care for more patients, whilst allowing them to maintain meaningful patient-carer relationships as well as a more realistic work-life balance,” Parsa added in a statement. The announcement was made at an event organized at the company’s headquarters in London yesterday, which brought together senior figures in the NHS including Chief Digital Officer Juliet Bauer, according to the Health Service Journal, and Health and Social Care Secretary Matt Hancock, who previously pledged his support for GP at Hand — a "digital first" service offered to patients in some parts of London through a partnership between Babylon and the NHS. To use it, patients need to change their registered NHS GP practice to GP at Hand and download the Babylon app — although users can also switch through the app if they have already downloaded it. 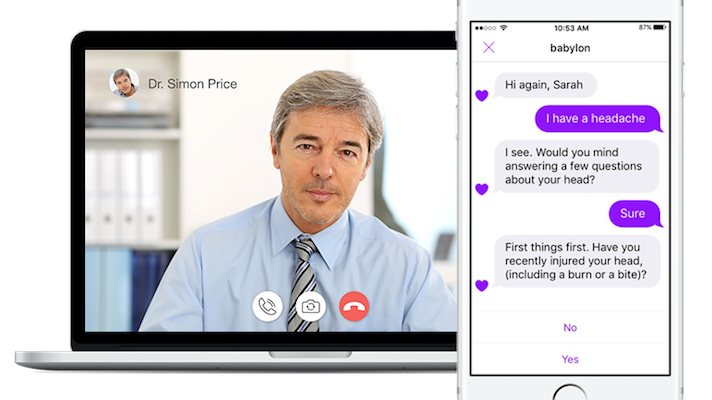 The service then enables access to video consultations with NHS GPs and an online symptom checker, among other features, and patients are able to book face-to-face appointments at five different London sites. In an interview with The Telegraph published this week, the health secretary described the service as "revolutionary" and said that he would like to see it "become available to all." Previous plans to expand the service to Birmingham were blocked by commissioners earlier this year. “Where a new service challenges the system, the right response isn’t to reject the new service but to change the system. The current postcode lottery cannot continue,” Hancock said. Speaking to HSJ, the secretary explained that he wanted to foster an "ecosystem of digital companies," including Babylon and its "current or future competitors" amid increasing criticism on social media. GP at Hand has faced increased scrutiny since it was announced that the service would be expanded to five London hubs in November 2017, with the Royal College of GPs (RCGP) criticising it for "cherry-picking" patients — claims Parsa dismissed as "complete nonsense" in an interview with Business Insider. In June, Unite, the largest trade union in Britain and Ireland, called on the government to scrap the service in a letter to former health secretary Jeremy Hunt, signed by more than 130 health professionals. The company also made waves earlier this year after claiming that its AI had demonstrated the ability to provide health advice "on-par with practicing clinicians" in an MRCGP assessment — the final test for trainee GPs set by the RCGP. More recently, Babylon announced that it would partner with Canadian organization TELUS Health to provide a version of its AI-powered app developed specifically for Canada.